Coming up with a list of the brightest comets in history is a difficult task. Why? The scale to compare the relative brightness of stars was only developed around 140 CE. It was invented by Ptolemy. Ptolemy's scale ranged from an apparent magnitude of 0 (the brightest star) to 6 (the faintest star). Since Ptolemy, negative numbers were added to the apparent magnitude scale in order to include comets, planets, the Sun and the Moon. Each number represents an increase or decrease of 2.5 times in apparent brightness from Earth's perspective. Comets weren't given, and ranked with, an apparent magnitude until the 20th century. So although a comet like X/1106 C1 could be the brightest comet in history, it's uncertain. To add to the challenge of making a list of the brightest comets ever, comet observations by ancient astronomers are difficult to pinpoint. Prior to Ptolemy's invention there were, of course, bright comets in the skies. However, several cultures and ancient astronomers described these seemingly brilliant objects moving quickly against the stars as gods or monsters and didn't record the year or month in which they appeared. During the first millennium BCE, that perception changed. Chinese, Babylonians and Greeks stripped the religious significance from comets and observed them somewhat scientifically. Some ancient astronomers from these advanced cultures even recorded the movement of comets over the course of several days, but rarely the brightness. Fortunately, we don't have to start from scratch in attempting to make a list of the brightest historical comets. The International Comet Quarterly (ICQ) did much of the work for us. 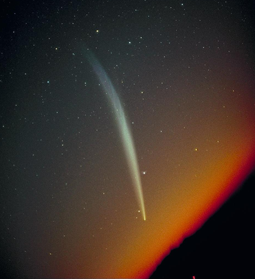 ICQ "is a non-profit scientific journal devoted to the observation, news, and study of comets; it serves as a link between amateur and professional astronomers in the exchange of useful observations (following a standardized format) and news regarding all comets." Recently, ICQ compiled a list of the brightest comets going back to 1935. The comets without an asterisk are comets identified by ICQ. The comets with an asterisk have been added to their list. For reference, the full moon has an apparent magnitude of -12.6.